Una premessa: André Perugia ha lavorato come consulente tecnico del marchio Charles Jourdan dal 1960 al 1966 (Fonte: Marie-Josèphe Bossan - L'Art De La Chaussure, 2004). Nel 1970 si é ritirato dall'attività lavorativa e - dopo la morte (novembre 1977) - ha lasciato i propri archivi alla Charles Jourdan, all'epoca guidata da Roland Jourdan, figlio del fondatore. 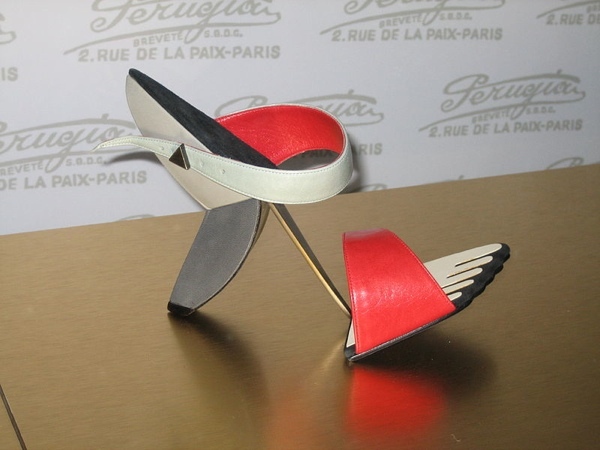 One key fact to know is that André Perugia worked for the brand Charles Jourdan as a consultant between the years 1960 and 1966 (Source: Marie-Josèphe Bossan - L'Art De La Chaussure, 2004). He retired in 1970 and upon his death (November 1977) left his archive to Charles Jordan, at that time led by Roland Jourdan, the founder's son. Il sandalo cubista di André perugia é stato messo in vendita da Saks Fith Avenue (New York) a partire dal novembre 1953, il che consente di modificare la datazione solitamente attribuita (1955). Un esemplare é conservato al Bata Shoe Museum di Toronto e questa foto di Sheila Thompson é una delle poche esistenti in rete. Opinione comune vuole che il sandalo sia un tributo a Picasso, ma alcuni hanno azzardato riferimenti a Fernand Leger e Georges Braque, quest'ultimo già citato da Perugia nella celebre scarpa pesce. 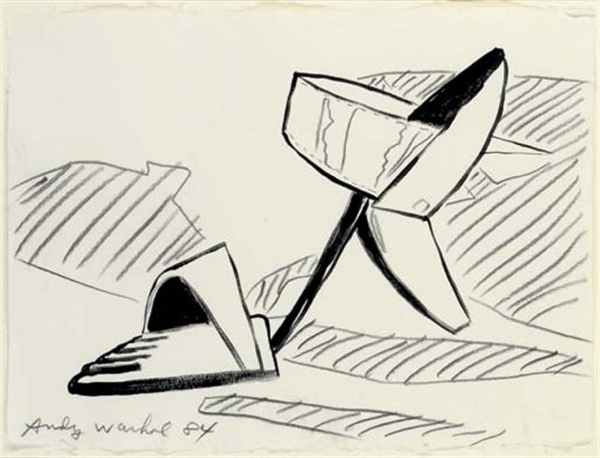 The cubist sandal was up for sale at Saks Fith Avenue starting from November 1953, so the recurring date in books and web sites (1955) must be amended. A Perugia's cubist sandal is kept at the Bata Shoe Museum of Toronto. This photo by Sheila Thompson is one of the few available on the net. It is been said it's a tribute to Picasso but over the years others tried to explain it with references to Fernand Leger and Georges Braque, the latter being the inspiration for the infamous fish shoe. "Sandalo disegnato da Picasso e realizzato da Perugia, fine anni '50. Realizzato in numero limitato come oggetto promozionale. Questo esemplare é stato regalato a un dirigente del Ministero della Cultura francese"
Che il disegno sia di Picasso é difficile da credere. Rimane valida la prima ipotesi (tributo a Picasso) considerando che proviene direttamente dalla Charles Jourdan che tra l'altro stava preparando la celebrazione del trentennale del sandalo cubista. 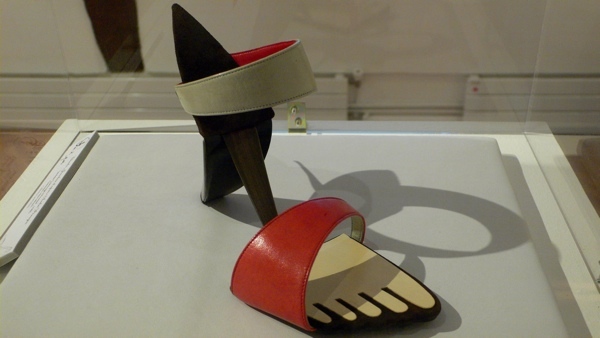 "Shoe designed by Pablo Picasso and fabricated by Perugia, late fifties. A small number were made as promotional items, this one given to an official in the French Ministry of Culture". The "shoe designed by Picasso" part is very unlikely, however the Picasso tribute theory still stands true: it came straight from the brand Charles Jourdan when they were planning the sandal's 30th anniversary. Altre foto del sandalo le ha scattate Andy Warhol (dove sono?) per realizzare alcune stampe - rare e poco conosciute - commissionate dalla Charles Jourdan nel 1984 per l'apertura di XAVIER DANAUD, un negozio C.J. a SoHo, New York. In contemporanea, presso la boutique Charles Jourdan a Dallas, veniva inaugurata la C.J. Shoe Museum Exhibit (cfr. foto nelle note): 85 scarpe di Perugia tra cui il nostro sandalo cubista, la scarpa-pesce e vari modelli appartenuti alle solite celebrità. Nota a margine: le stampe di Warhol - su carta Moulin du Verger di produzione francese e fatta a mano - sono andate all'asta nel 2009 e nel 2010. Other pictures of the sandal were taken by Andy Warhol (where are they?) to produce some rare screen-prints commissioned for the 1984 opening of XAVIER DANAUD, a Charles Jourdan shoe store in SoHo, New York. Meanwhile in Dallas, Texas opened the C.J. 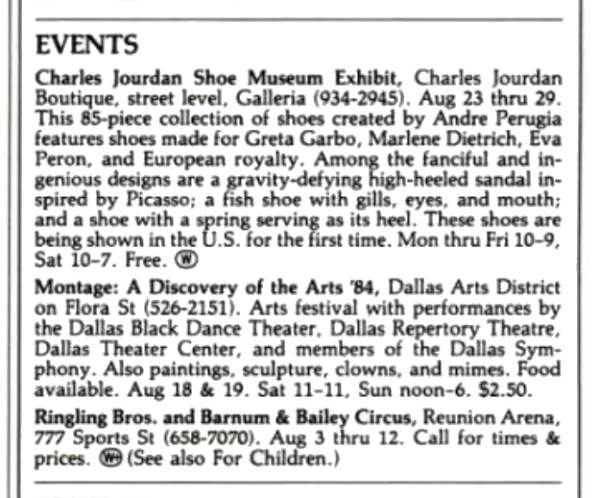 Shoe Museum Exhibit (August 1984) at the Charles Jourdan boutique. 85 Perugia models including our sandal, the fish-shoe and the usual array of shoes owned by celebrities. On a side note: Moulin du Berger is a hand-made French paper. 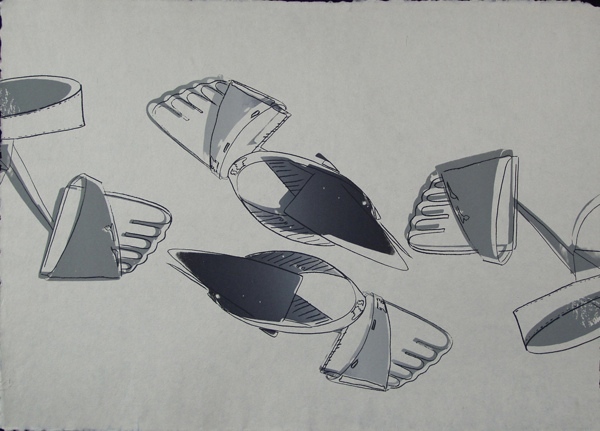 The screenprints went on auction back in 2009 and 2010. Esiste almeno un'altra stampa dei sandali, ma é impossibile da trovare in rete. Rimediamo con un altro Warhol battuto da Christie's per $ 32.810 nel 2007. 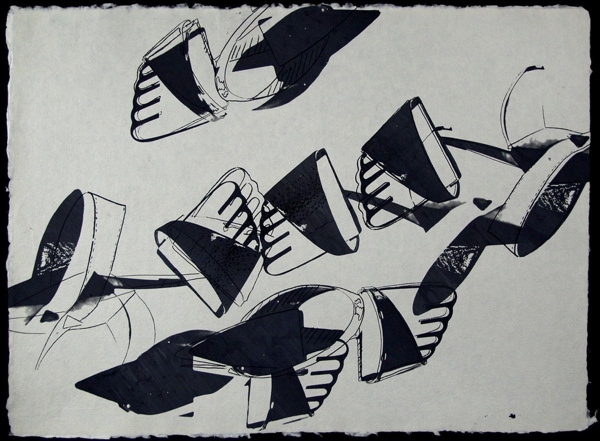 There's at least another screenprint of the sandals but impossible to find on the net. We'll save the day with another Warhol sold at Christie's back in 2007 for $ 32,810. E per concludere: l'unica foto disponibile della replica Charles Jourdan per il trentennale del sandalo di Perugia, in mostra al Museo di Saint-Maur (Ile de France) nell'ambito dell'esposizione "Step By Step" (2008). And to wrap things up: this is the only picture available of the C.J. replica for the 30th anniversary, shown at the Saint-Maur Museum (Ile de France) at the "Step By Step" exhibit back in 2008. Charles Jourdan ha venduto il marchio XAVIER DANAUD nel 1992 a Yves Desfarge, ex direttore generale del marchio stesso. Charles Jourdan sold the brand XAVIER DANAUD back in 1992 to brand's former general manager Yves Desfarge. Ritaglio di giornale prezioso, ma le scarpe non erano mostrate per la prima volta negli Stati Uniti. Erano semplicemente dimenticate. Nel dicembre dello stesso anno (1984) la mostra arrivò a New York, così come riportato dal New York Times. A precious paper clipping, but the shoes were not shown for the first time. They were just forgotten for almost 30 years. In December (1984) the exhibition arrived in New York as riported by The New York times. MEANWHILE, a retrospective showing of the shoe designs of Andre Perugia opened at Charles Jourdan in Trump Tower. 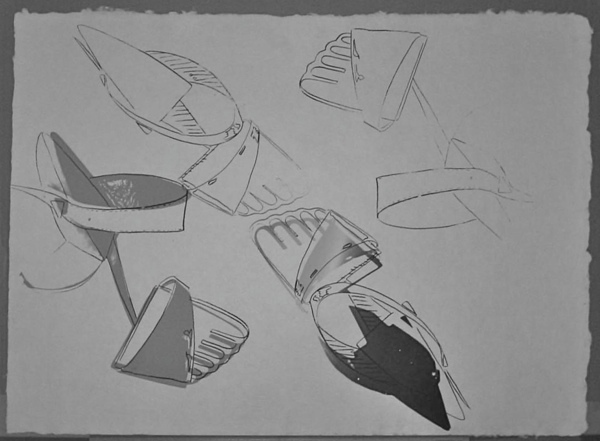 One of the great shoe designers from the 1920's to the 1950's, Perugia created designs that were more sculpture than anything else, including a high­ heeled shoe without a heel and a shoe with a corkscrew heel. 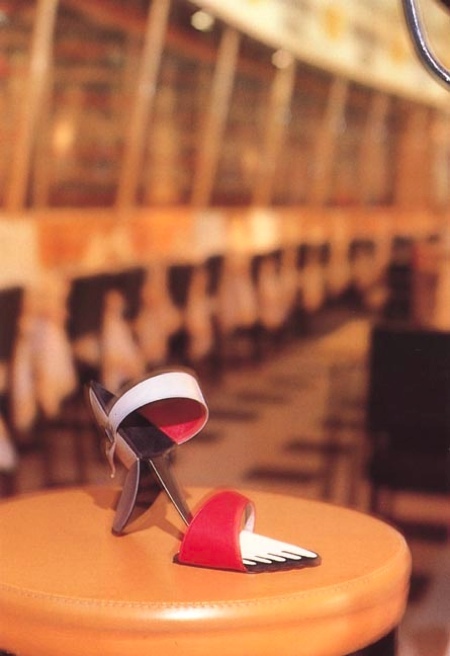 He also did a shoe called the Picasso, which, with its cantilevered heel, was never made for walking. The show is worth a detour. Il sandalo di Perugia nascosto dal logo YSL. 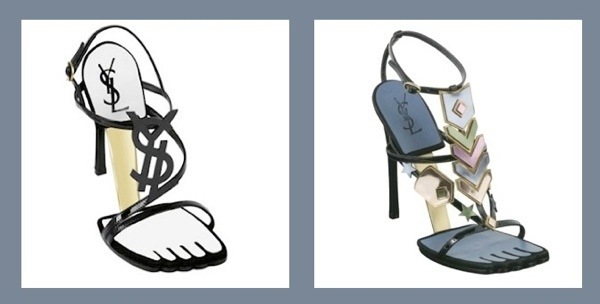 The Perugia sandal behind the YSL logo.